When the statement "It's just like BPR from twenty years ago, but with tech that actually works" rang out at the recent London FORA Summit, the nods around the room were palpable. Example use-case: automating invoice processing across multiple business applications handling rule-based exceptions. RPA is different from traditional automation software as it is inherently capable of recognizing and adapting to deviations in data or exceptions when confronted by large volumes of data. In effect, it can be intelligently trained to analyze large amounts of data from software processes and translate them to triggers for new actions, responses, and communication with other systems. 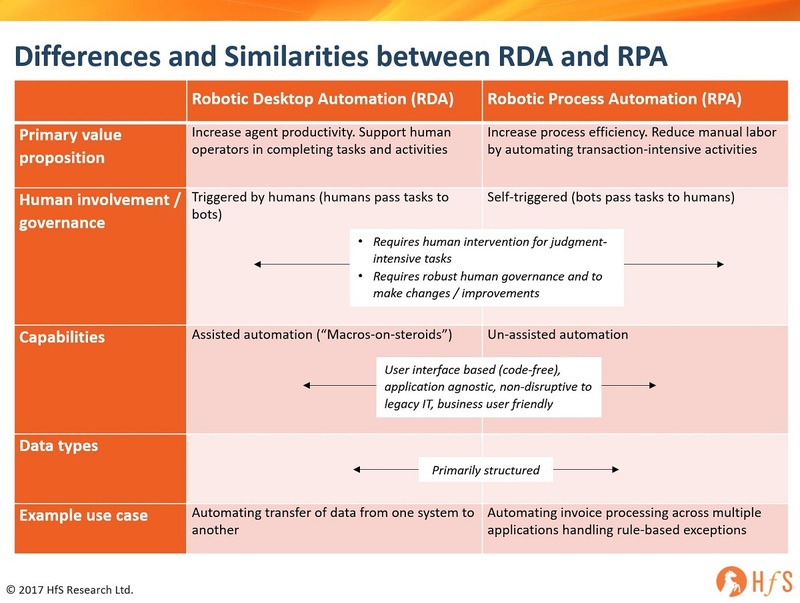 RPA describes a software development toolkit that allows non-engineers to quickly create software robots (known commonly as "bots") to automate rules-driven business processes. At the core, an RPA system imitates human interventions that interact with internal IT systems. It is a non-invasive application that requires minimum integration with the existing IT setup; delivering productivity by replacing human effort to complete the task. Any company which has labor-intensive processes, where people are performing high-volume, highly transactional process functions, will boost their capabilities and save money and time with robotic process automation. Much fr RPA is self-triggered (bots pass tasks to humans), but requires human intervention for judgment-intensive tasks and robust human governance and to make changes / improvements. 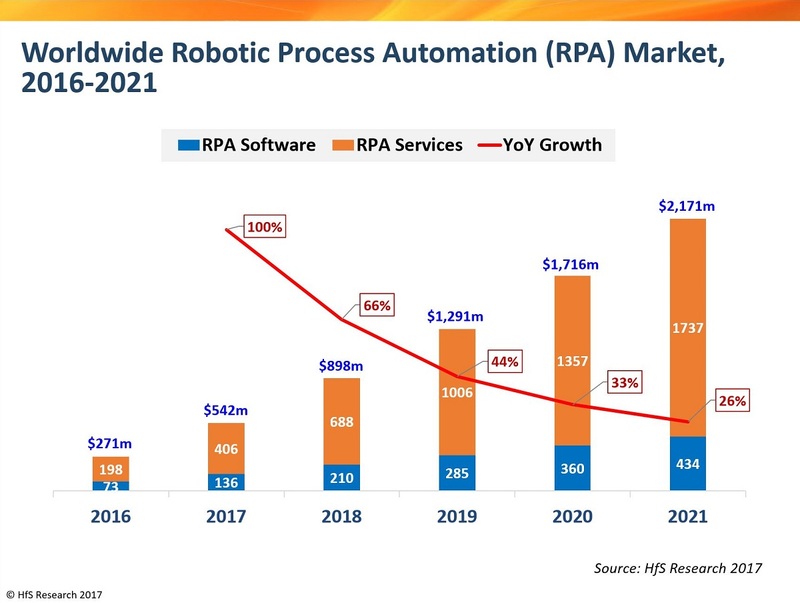 In addition to RPA, the other software toolset which comprises the emergence of enterprise robotics software is termed RDA (Robotic Desktop Automation). 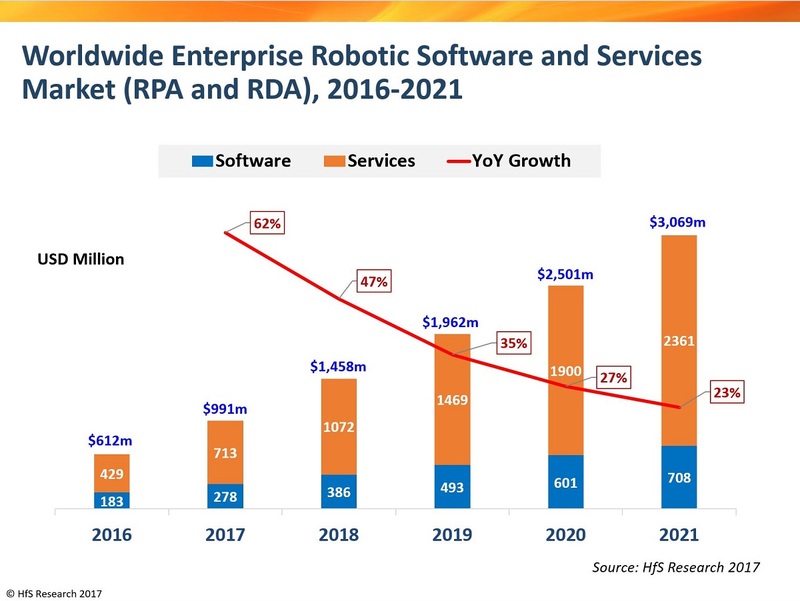 Together with RPA, RDA will help drive the market for enterprise robotic software towards $1.5bn in software and services expenditure in 2018 (with close to three-quarters tied to the services element of strategy, design, transformation and implementation of enterprise robotics). 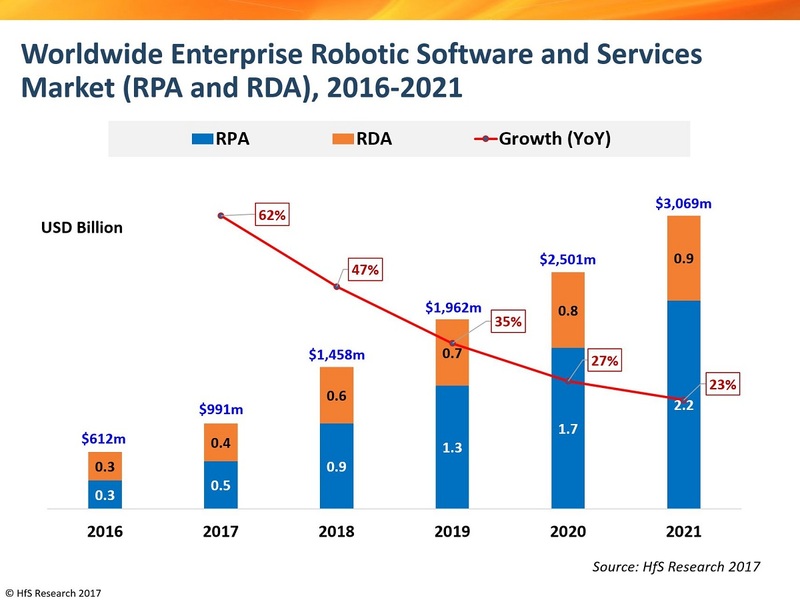 HfS' new estimates are for the total enterprise robotics software and services market to surpass $3 billion by 2021 as a compound growth rate of 39%. Phil, This really is a great insight. This is very near to reality and in stark contrast to few others that report numbers with many inaccurate assumptions. Thanks and keep sharing the great content . 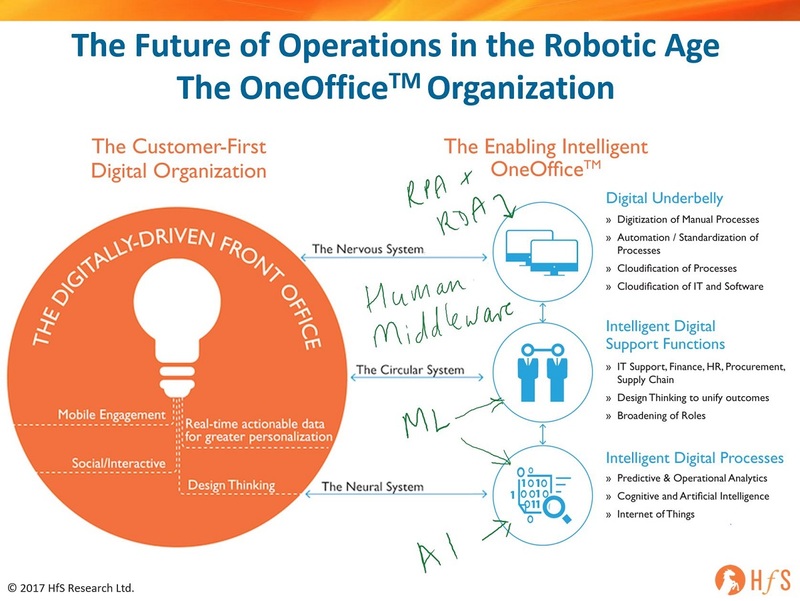 Phil as a pre-cursor to RPA/Automation shoud'nt orgainzations re-engineer process( BPM) .We find a lot of organizations trying to implement RPA either through an organization re-structuring or before it leading to implementation failures- what is your take on this ?